Cannot be autoclaved., Cannot be autoclaved., Cannot be autoclaved., Cannot be autoclaved. The contents are easy to see, it is lighter than the glass bottle and it is safe because it will not break even if dropped accidentally. 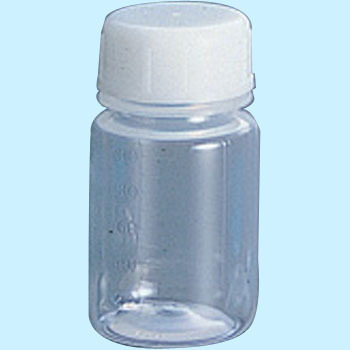 It is very easy to use because it is a type without a stopper. This review is about item#33142645. Store and store sample items. It is a difficult struggle because the opening is narrow and large items do not enter. Other than that, the size and the clear place are as you wish. This review is about item#33142627. It is the second purchase. Very easy to use and useful. Although I am using a white container at present, I also tried purchasing a transparent type for testing. Compared with a white container, it feels a little soft. This review is about item#33142611. It is used to dilute the solution, but the display of the scale is slightly thin.